The Water Doctor provides iron and sulfur removal to areas all over central Florida including Deltona, DeLand, Sanford, Ormond Beach, DeBary, and beyond. Taste iron in your water? Smelling too much sulfur when you turn your faucet on? Call the Water Doctor today, 386-985-9960. 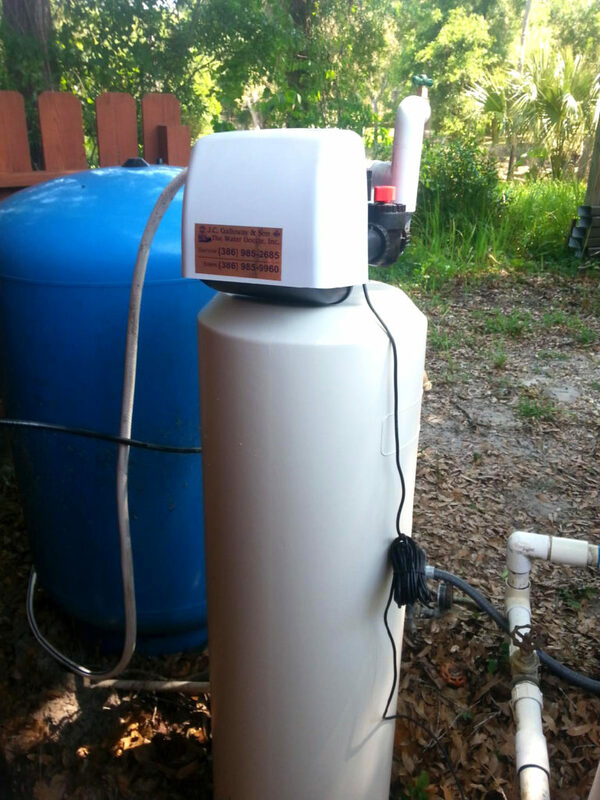 The Water Doctor provides chemical-free water treatment to your home or business anywhere in or around Volusia, Seminole, Lake, and Flagler County. Our Iron-Sulphur Home System eliminates iron stains and rotten egg odors from Hydrogen Sulfide because the Iron Systems filter media has high amounts of Manganese Dioxide, an active ingredient, proven to effectively treat Iron and Hydrogen Sulfide. Our Iron-Sulphur Home System comes with the best warranty in the business, including, lifetime on mineral tanks, seven years on control valves and five years on brine tanks to the original owner. Our Iron Sulfur System is chemical free because chemical oxidizing agents such as Chlorine, Hydrogen Peroxide and Potassium Permanganate are typically not required. 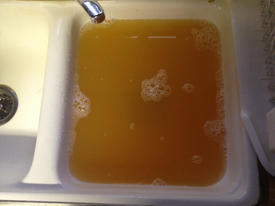 *Providing Chlorine is not required for disinfection or when iron bacteria is present. The Iron and Sulfur Home System consists of a control valve, pressurized mineral tank and our special filter media. Water flows through the filter media, which acts as a catalyst to use the oxygen content of the water to oxidize Iron, Hydrogen Sulfide and Manganese. Subsequently, these oxidized particles are trapped by the filter media and removed from your water during the backwash cycle. Please note the homeowner had 12 ppm of Iron, and NO chlorine or other oxidizing chemicals were used! Check out the “pre” photo and compare it to the “after” photo. 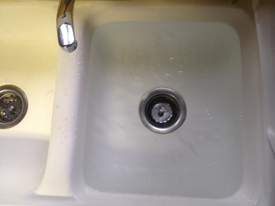 The water is so clear it’s hard to see water is in the sink. Iron Filter media is a high rate, granular filter material used for removing Hydrogen Sulfide, Iron and Manganese compounds from water supplies. The media operates both as a filter working with an oxidant and as a catalytic media due to its ability to accelerate the reaction between the oxidizing agent and any prevalent dissolved Oxygen with Sulfide, Iron and Manganese present. Dissolved iron, Manganese and Hydrogen Sulfide will stay in solution unless the equilibrium is changed. Iron and Manganese that is not oxidized become catalytically precipitated and then adsorbed directly on the media. The media is a very dense media that stops oxidized (precipitated) forms of Iron, Manganese and Hydrogen Sulfide from passing through the bed. Most of the Manganese is rapidly removed in the first few inches of the media where it is further oxidized to Manganese Dioxide. The adsorbed Manganese, Iron and precipitated Sulfur are expelled during backwash. Any insoluble ferric hydroxide particulate growths are also expelled during backwash. The media must be properly backwashed to break loose and remove the filtered contaminants and precipitated Iron, Manganese and Hydrogen Sulfide. (Every day is typical). System sizing of the control valve and tank are necessary to sustain media performance. A continuous reaction occurs with the addition of an oxidant, regenerating the media surface and replenishing the media. For difficult applications, Our Iron filters can be enhanced with aeration, chlorination, and ozone. Our Iron filters are recommended before softeners to protect the ion exchange resin from fouling. Service flow rate – 6 GPM / cu. ft. The Iron Filter acts as a catalyst to use the Oxygen content of the water for oxidation. Using an ORP Meter, any reading above a negative 170 milivolts indicates Manganese Dioxide can be used effectively without the use of additional oxidants in most applications. Any reading below indicates oxidants will be required. For improved performance, the Iron And Sulfur Filters electronic control valve can be programmed for “air draw” to introduce ambient air to the filter’s pressure tank for greater oxidation and improved removal performance.